CVSA-certified inspectors across North America completed 73,475 truck and bus inspections during the 72-hour enforcement and safety outreach campaign. International Roadcheck provides the opportunity to promote the safety improvement efforts and accomplishments that enforcement and industry achieve every day. On June 3-5, 2014, commercial motor vehicle inspectors across North America completed 73,475 truck and bus inspections during International Roadcheck 2014, the annual 72-hour enforcement and safety outreach event carried out by members of the Commercial Vehicle Safety Alliance (CVSA). Of the 73,475 total inspections, 49,656 (67.6 percent) were North American Standard Level I Inspections, which is the most thorough roadside inspection. Level I inspections include a 37-step procedure that involves an examination of both the driver’s record of duty status and the safety of the vehicle. Drivers are required to provide items such as their license, endorsements, medical card and hours-of-service documentation, and are checked for seat belt usage and the use of alcohol and/or drugs. The vehicle inspection includes checking items such as the braking system, coupling devices, exhaust system, frame, fuel system, lights, safe loading, steering mechanism, suspension, tires, van and open-top trailer bodies, wheels and rims, windshield wipers, and emergency exits on buses. Of the 49,656 Level I Inspections conducted during International Roadcheck 2014, 23.0 percent included Out-of-Service (OOS) vehicle violations. There were a total of 72,415 driver inspections, including those conducted during all levels of inspections, from which 4.8 percent were found with OOS violations. There were 825 seatbelt violations issued. Other inspections conducted included Level II walk-around, Level III driver-only, and Level V vehicle-only inspections. In addition to the Level I Inspections, International Roadcheck 2014 also placed special emphasis on hazardous materials/dangerous goods (HM/TDG) regulatory compliance. Although they represent a smaller segment of truck transportation, such shipments require special paperwork, driver credentials, vehicle safety, load securement, and hazard identification and communication, including placarding, to signify the added risks of exposure in the event of a crash, leak or fire. 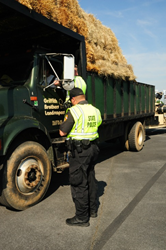 A total of 5,738 inspections included HM/TDG during this year’s event, with 919 (16.0 percent) found with vehicle OOS violations and 172 (3.0 percent) with driver OOS violations. CVSA estimates that for this year’s International Roadcheck, over 10,000 CVSA and FMCSA inspectors participated at approximately 2,500 locations across North America. On an annual basis, nearly 4 million inspections are conducted across the continent. Since its inception in 1988, Roadcheck inspections have numbered more than 1.4 million, resulting in an estimated 318 lives saved and 5,840 injuries avoided. International Roadcheck is sponsored by CVSA, North America’s leading commercial vehicle safety-enforcement organization, with participation by the Federal Motor Carrier Safety Administration, Canadian Council of Motor Transport Administrators and the Secretariat of Communications and Transportation in Mexico. CVSA is an international not-for-profit organization comprised of local, state, provincial, territorial and federal motor carrier safety officials and industry representatives from the United States, Canada and Mexico. Our mission is to promote commercial motor vehicle safety and security by providing leadership to enforcement, industry and policy makers. In addition, CVSA has several hundred associate members who are committed to helping the Alliance achieve its goals: uniformity, compatibility and reciprocity of commercial vehicle inspections, and enforcement activities throughout North America by individuals dedicated to highway safety and security. For more information, visit http://www.cvsa.org.